I have one as well, great shooters, as reliable as our famed AK47s (really) and light and handy. I just wished we could get a collapsible stock for these. They cut the stock off, mill the end and install an AR tube adapter. Last edited by ChileRelleno; 02-23-2018 at 09:14 AM. We are not the Supreme Court - we are moderators of a firearms forum, charged with keeping the board open & functional. Our opinion is the same as we've been putting forth all this time. You may play "legal eagle" on your own, with your own pistol and whatever arm braces you may have, but do not lead others astray with your "ATF letters" and "findings". The U.S. Code supersedes these "letters" and that is the position on arm braces we're taking. Your 'opinion' is wrong per what the most recent ATF clarification letter said. You mentioned the ATF issued clarification letter and you didn't even reference or quote the most recent one but were referencing the old one from 2015 (which the ATF has even come out and admitted was incorrectly construed and interpreted to mean something that is incorrect). That is the issue, you are stuck in 2015. So instead of spreading false information that a pistol with a pistol brace is a federal felony, maybe it is time for you to do some more research on the subject as it is clear you are not up to date on said subject. This isn't about playing "legal eagle" but is rather about what the ATF has stated on this subject. You know, the law enforcement agency that is tasked with enforcing said laws related to this subject. The ATF issued a clarification letter that said if the brace "accidentally, incidentally or occasionally" touched your shoulder, it would not create a SBR. So I am supposedly leading people astray when I am quoting the 2017 letter and the ATF's most recent statements on the issue, but you aren't when talking about an old 2015 letter? Wow. Again, I will quote the 2017 and its pertinent part for others that read this thread so they can be informed about what the government agency tasked with enforcing federal firearm laws says on this subject rather than some random mods on a forum. an NFA firearm has not necessarily been made when the device is not re-configured for use as a shoulder stock — even if the attached firearm happens to be fired from the shoulder. If, however, the shooter/possessor takes affirmative steps to configure the device for use as a shoulder-stock — for example, configuring the brace so as to permanently affix it to the end of a buffer tube, (thereby creating a length that has no other purpose than to facilitate its use as a stock), removing the arm-strap, or otherwise undermining its ability to be used as a brace — and then in fact shoots the firearm from the shoulder using the accessory as a shoulder stock, that person has objectively “redesigned” the firearm for the purposes of the NFA. Yes U.S. Code supersedes anything and I have asked you to post and quote said U.S. Code that defends your position. You have yet to do so because you can't. So instead of spreading false information that a pistol with a pistol brace is a federal felony, maybe it is time for you to do some more research on the subject as it is clear you are not up to date on said subject. . Please show me where I've ( or any other mod has ) been saying that. The felony is when folks - for example - state they assembled their arm-braced pistol to evade the $200 NFA tax. That is tax evasion, pure and simple. The problem here is you don't have all the information ( you can't see deleted posts ) and are assuming the mods are idiots. P.S. If my opinion was "arm-braced pistols are a federal felony", there wouldn't be any threads on them here. D'Oh! If you always shoulder your arm-braced pistol, you have created an untaxed SBR. If you add an arm brace to your pistol with the intention of firing it from the shoulder, you have created an untaxed SBR. The ATF said that isn't true. Remember that if no physical modifications are done to the pistol brace to redesign it as an NFA item, then it isn't an NFA item. Shooting from the shoulder does not make an NFA item. Saying that buying or building a pistol with a factory pistol brace and firing it from the shoulder is a felony due to tax evasion is false as it can't be tax evasion as the ATF just clearly stated it isn't illegal as a pistol brace wasn't designed to be fired from the shoulder and can't be fired comfortably from the shoulder and as a result an NFA firearm HAS NOT been created. If an NFA item had been created, then yes a $200 tax stamp would be needed and if a $200 tax stamp had not been purchased it would be tax evasion. But since no NFA item has been created, there is no tax stamp needed Nails. Your whole premise is nonexistent. The moderators do what is necessary to keep the forum from being targeted by the left. The U.S. Code is the law of the land, and ATF letters are as ephemeral as toilet paper. We will continue to enforce forum rule #1 as we see fit. Enjoy the day off for "mod pushback". No love for the Hi-Points? They can't keep the 10mm 1095TS's on the shelves. The 9's are great values, and the aftermarket has exploded with stuff for them. When a 1100fps Remington JHP runs 1400fps out of a 16" barrel? Great home defense. 20rd mags out there for them now. I have a G17 Gen2 Sub2000, 2 different PSA Glock lowered AR's. One is a 16", the other is a 10.5". The 10.5 has a LRBHO lower I got as a billet blem for $99 shipped. I now have 2 Matrix Arms LRBHO lowers to build. We know Liberty Civil defense penetrates Level IIIA body armor out of a pistol. I wonder what rounds coming out of a PCC would penetrate it? No love for the Hi-Points? Nobody wants to talk about Hi-Point carbines. They're boring cuz they "just work", ya know? That and the fact that they are crude, hideous, un-ergonomic and lack reliable high(er) capacity magazines (yes I am aware of the Pro Mag and the RedBall mags). But as you stated, they work. I can't bring myself to do the Thingmeister 1911 mag catch conversion to the 45 carbine so I can run 28rd drums. It's heavy enough as it is! I did not know the 10mm hi point was out. I kind of want to get one and scope it just for fun, see how far I can lob 200 grain boolets out there. I kinda hope someone else makes one. I think we have the Mech Tech Glock uppers, obscure / super expensive MP5/10s, limited AR build stuff, and now this. I’d buy a 10mm Sub2k in a heartbeat. I have heard people are taking game out to 150 yards with 10mm carbines. That is a pcc I can get behind. I am not a huge fan of hi point, but my hornady lock and load is currently set up for my favorite 200 grain 10mm load. Some fun could be had even with a hi point. I’d buy a 10mm Sub2k in a heartbeat. Not me. I have oodles of .40 Glock mags. I have a 9mm Subbie. I am afraid the 40 would kick itself to death. 10 from Kraptek? Not a chance I would take. +2..... Ruger PC9 ($400-$500), Hi Point 995TS ($200-$300), or Kel Tec 2000 G2 ($400-500) would be what I'd look at. If the OP has a little larger budget, then the CZ Scorpion ($800-900) or an AR9 hands down. or the pak or nak-9($4-600)?!?!?!?! is this AK files or glock talk!?!??! wtfork spoon!!!! Finally got a chance to run a few fun sticks thru the FX-9 Saturday. This thing is going to be a blast!!! All I have on top now is MBUS flip up sights....planning on adding a Holosun 510 very soon which should work great with all the reviews I found and read. I've been wanting to try out some of the solar dots myself. I went to the range and shot a couple of 9mm carbines yesterday. Lotsa fun. Shot a CZ Scorpion EVO and JP GMR-15. So what have other members shot and what do you think? I'm thinking about dropping some coin on a pistol caliber carbine. You can laugh ,however I have a Kel Tec Sub 2000 gen 2 for over a year now,about 2000 rds through it cheap 9mm all types. 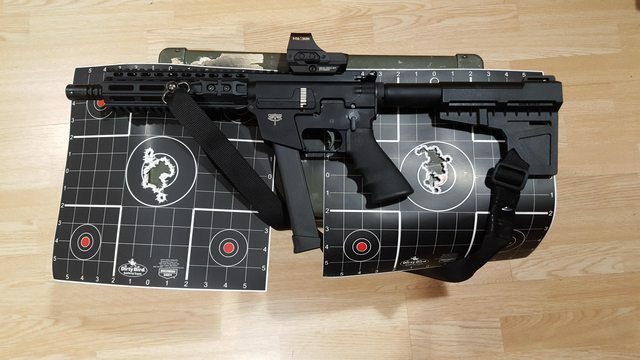 No malfunctions as of yet,really accurate and handy,paid $400 OTD,no need for me to spend more than that on some of the other 9's coming on the market,like Sigs $2000 MPX the Kel Tec has been great.Mine takes all Glock 17,and 19 mags.This rifle can really handle.Carried it in a sling over my back a year ago in Pole Bridge Montana grizzly country,loaded with Buffalo Bore 147 grain plus P outdoorsman hardcast,and felt safe about 4 pounds weight. So what happens when you build one of these . . .
. . . in 9mm or 10mm? Is that barrel less than 16"? If so, I thought a vertical grip puts it in AOW territory? Not if it's over 26 inches overall length. It makes it a firearm. I'm sure nails will be along shortly to chastise you for not knowing. After 5+ years of us discussing this, are you really asking that? Thompson had a 2 gripped firearm, as does franklin armory (xo26), just as a few examples. Franklin Armory is making "other firearms", not "rifles" or "handguns", and thus has no restrictions on VFG use. I assure you nalioth, Thompson has offered a pistol gripped firearm. They do exist. And was the precedent that franklin armory was able to obtain approval for their design. I would also like to note, I didn't mention pistols in my previous post. I said firearms. Right. We're talking "Thompson" and you link to an auction for an "Auto-Ordnance". FYI: "Thompson" isn't a colloquialism - it was a company name. In any event, if it was made before the NFA of '34 went into effect, your argument is moot. You don't have to admit you're wrong. I know that would be expecting too much. One last note, the manufacturer date doesn't change anything. Pre34 or post '34 is irrelevant. The gun that I linked above is not classified as an AOW. For the same reason that you mentioned the franklin armory isn't. Why get a 9mm Carbine, when you can get an AR-15 that fires a rifle cartridge for under $400? There are plenty of reasons for a 9mm. Ammo prices. Subsonic ammo for suppressed shooting. Recoil. Longevity. The MP5 at BFLV has how many rounds on it now? Can't shoot steel at my 20 yard pistol range with an AR-15. I can with a PCC. Oh, and...my MechTech upper is still on backorder. Been that way for a month and a half now. Can't really call it a carbine, but I picked up this FX-9 for a cheap range toy and I really like it. Its light, accurate and uses glock mags. Its amazingly quiet with subsonic ammo. I added the Holosun510C, Hogue grip and sling. I see plenty of utility in this thing at close range. I shot it at an indoor range yesterday (20 yds) and it's an attention whore. Wondering how you're liking this after a few months and if anyone else has any experience with the FX-9 in pistol configuration. I wouldn't be shooting suppressed, but was wondering how much if at all the blowback would affect a left-handed shooter? I've read it's pretty bad suppressed, but just looking for some experience.